If you are serious about improving your skiing, there is no better way to maximise your time in Val d'Isère and ensure you make the most than to take some private tuition. Even if you are not doing an instructor course, you can benefit from the expertise of ICE's team of BASI Trainers in a private lesson. Because we are part of BASI, all of the training you receive in a lesson is by our team of skiers or snowboarders, who are all trainers and assessors for BASI. 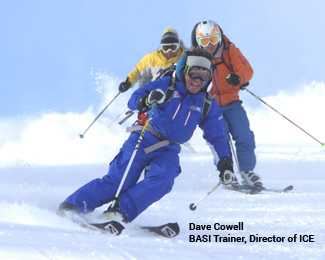 They are trainers for BASI because of their expertise, skiing and snowboarding skills and experience. Furthermore, most of the training staff train to the BASI level 4, meaning that they are well placed to give you advice on future progression whatever your current level, on and off-piste. Either Mark, Rupert or Dave would be delighted to chat through what there is to offer and you can speak to them directly by calling 0870 760 7360 and choosing option 3. Alternatively you can visit the contact page and obtain their direct line numbers and email addresses. Private tuition from the world's finest coaches.